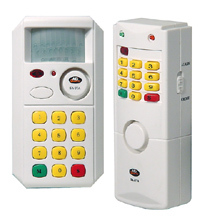 SensaGuard EasyAlarm The easyalarm is a pre-wired instantaneous alarm system suitable for any property. The easyalarm provides stunning operational features and a strong visual deterrent. Absolutely no knowledge of wiring is required to set up this system. Weve pre-wired all cables to detectors to make installation simple and trouble free. Its ready to go straight from the box.. and you cant get it wrong! 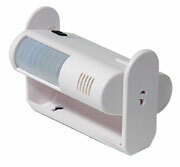 Motion alarm with chime function A free standing PIR motion activated alarm with door chime function. Using this free standing device you can set up an instantaneous alarm or chime in seconds, suitable for many applications. • New product for 2004! Battery operated shed alarm suitable for outbuildings, garages, porta-cabins and other small rooms. Provides an audible warning of intrusion from both internal and external sirens or can be set to chime when a door is opened. 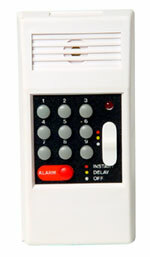 Multi-purpose door alarm A keypad operated alarm with comprehensive features. Use on any type of door around the home, caravan or even to protect prohibited areas such as medicine cabinets etc. Key Operated Shed Alarm Shed alarm with external siren and twin magnetic contacts. Caravan Alarm A motion activated alarm panel ideal for caravan protection that requires no power supply. This panel can mounted anywhere and does not require any power supply or wiring of any kind.